It’s the #1 most recommended baby registry item of every new mom, but this week, the Fisher-Price Rock ’n Play Sleeper is at the center of some heated controversy. The American Academy of Pediatrics is calling for the device designed to help infants fall asleep to be recalled “immediately,” after new data from Consumer Reports found 32 infant deaths linked to the sleeper since its debut in 2009. This comes just a week after Fisher-Price stated that 10 infants have died while using the Rock ’n Play since 2015. “This product is deadly and should be recalled immediately,” said Kyle Yasuda, president of the American Academy of Pediatrics, in a statement. Despite the AAP pressing for a recall, and even amidst Fisher-Price’s own fatal findings, the company has refused to issue such. They did, along with the Consumer Product Safety Commission (CPSC), issue a joint warning to consumers Friday about the dangers of the product, but stopped short of a recall. 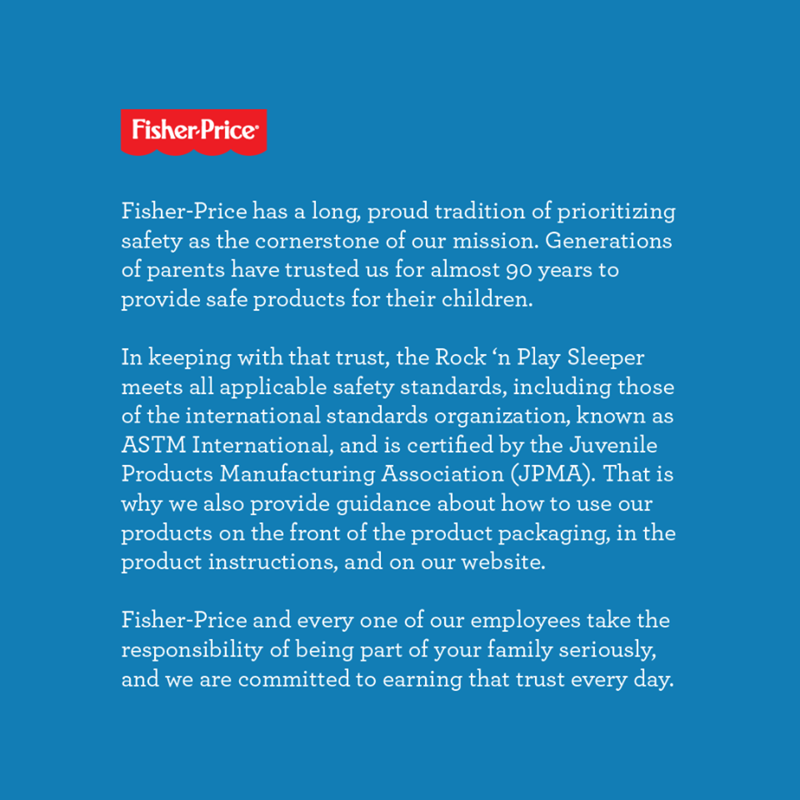 Fisher-Price, which stood by the safety of the Rock ’n Play and said a recall was not necessary, can keep selling the product. Here’s why. Each of the 10 reported deaths occurred in cases where the infant rolled over from their back onto their front while unrestrained by the product’s harness. 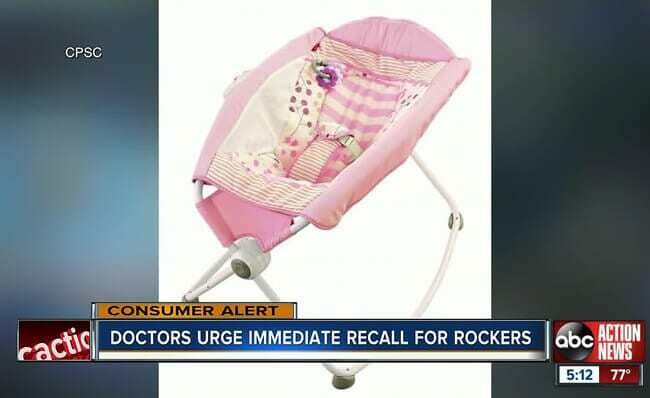 The warning recommended that consumers not use the Rock ’n Play with children older than 3 months or those who can roll over, according to the federal regulator, the Consumer Product Safety Commission. As my own personal side note: if a harness is provided for the product’s safety use, and you as a parent choose not to use it, that does not automatically make the company responsible for bodily harm or death. They provided measures necessary to keep a child safe while using their product, but they cannot be held responsible if you choose not to use said safety measures. Still, we’re talking about 32 babies who have lost their lives here. There’s no room for blame-shifting or taking safety lightly. “It is essential that the product warnings and instructions are always followed,” he said. But the AAP argues that Friday’s consumer warning didn’t go far enough to protect infants. “The Rock ‘n Play inclined sleeper should be removed from the market immediately. It does not meet the AAP’s recommendations for a safe sleep environment for any baby. Infants should always sleep on their back, on a separate, flat and firm sleep surface without any bumpers or bedding,” Dr. Rachel Moon, chair of the AAP Task Force on SIDS, said in the statement. Conversations are swirling among moms on social media this week saying this was a “must have” after giving birth to their kids. 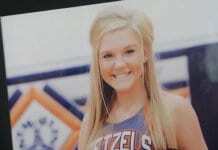 Several also reiterated that it was a temporary item, retired the second their child showed signs of rolling. This has me chatting this morning. What do you think? Should this product and those like it be on the market? When our kids watch us spend time with Jesus, they will begin to understand that our love of God grows when we spend time in His presence.